Do Cows Really Have Four Stomachs? Many people who’ve never been near a dairy farm have heard that cows have four stomachs. It’s one of the questions I get asked most often. The answer: Yes and no. 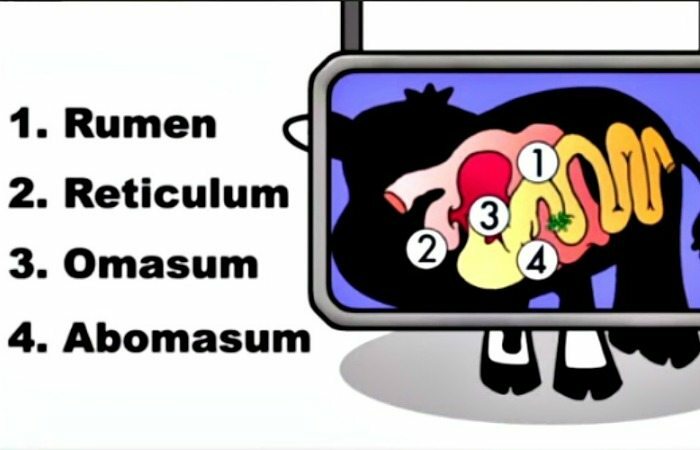 Cows technically only have one stomach, but it has four distinct compartments. It is very different than a human stomach. That’s why people often say that cows have four stomachs. Rumen – This is the first part of the cow’s stomach. It helps break down complex plant products like grass. Reticulum – Here the food mixes with the cow’s saliva and produces cud. Cows burp up the cud into their mouths and chew it to help break it down more. When you see a cow that looks like she is chomping on bubble gum, really she is chewing her cud. Omasum – Here all the water is absorbed out of the food. Abomasum – Here is where the food is finally digested, similar to what happens in a human stomach. What exactly is it that goes into our cows’ stomachs? Our cows are fed a mix of corn silage, hay silage, grain (corn), distillers grains, and soy bean meal. On our farm, we grow the corn, wheat and hay that goes into our cows’ feed. Speaking of stomachs, check out our dairy recipes that are farm family favorites! This post was originally published on May 10, 2010 and has been updated with new images. 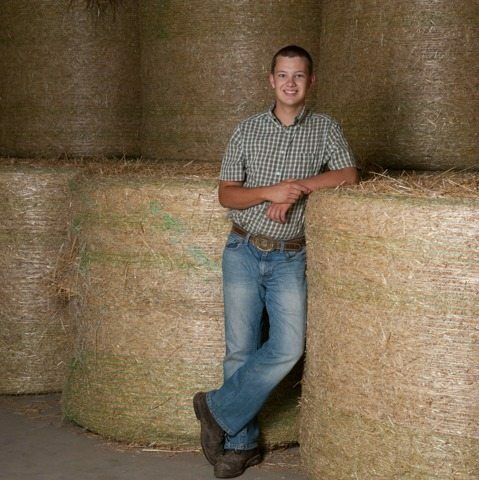 Hello, my name is Mason Horning and I am a sixth generation Michigan Dairy Farmer. 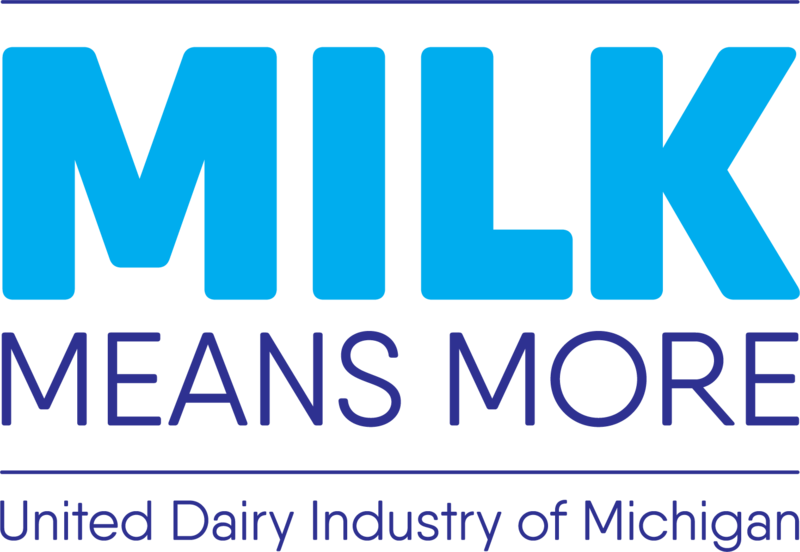 My passion for dairy comes from my family’s 140-year-old dairy farm in Manchester, MI. I graduated from Michigan State University with a certificate focused around Agriculture Business Management and Crop and Soil Sciences in 2017. Currently, I am employed on my family's dairy farm and work day to day operations. The majority of my roles on the farm are focused around our crops we grow to feed all of our animals. Some of those jobs include: planning the crops we will grow, soil sampling, crop scouting and monitoring, equipment maintenance, and doing fieldwork. In addition to the crops, I also help out with the cows and calves. Some of those jobs include: milking, feeding calves, cleaning pens, bedding pens, practicing preventative health care procedures, and maintaining records for each animal. Thank you for the information! We were trying to figure out how a cows digestive system works! Thanks for the clear explanation. I guess you could say it’s easily digested. Many many thanks to those who breed cows and take good care of them. So…do they have four stomachs or not? Thank you for the information my students were amazed with the special abilities of the cow’s stomach. Another wonders of God Jehovah’s creation. Again thank you and God bless. Good Short Article and focused on what the title says. Keep writing! Cud not have been easier to play udderstand. No,they don’t have four stomachs.They have one stomach comprising four different compartments! no, humans only have one stomach, but is connected to the small intestine and large intestine.